All Quiet on the Western Front is a 1930 American war movie that was produced by Carl Laemmle, Jr. It was directed by Lewis Milestone. The movie was released on April 21, 1930 in North America. The movie received positive reviews. Rotten Tomatoes gives the movie a 97% which is certified "fresh". The movie also won two Academy Awards for "Best Picture" and "Best Director" for Lewis Milestone. The movie is also ranked #54 on the AFI's 100 Years... 100 Movies list. 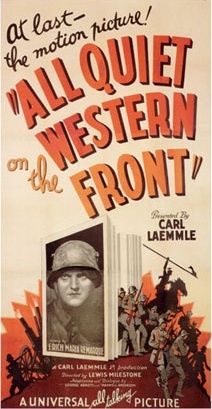 The movie is based after the novel, All Quiet on the Western Front. This page was last changed on 5 April 2019, at 01:32.